The use of a dedicated server, even at home with a few computers or in a small home office, definitely makes good sense. However, many users shy away from the complicated installation and configuration of individual services via the command line. The Zentyal server, however, offers a much easier way to get things set up, and a free community variant is available . With the help of Zentyal's web-based interface, you can get your server configuration up and running in almost no time. The Zentyal server, which originated in Spain, has been around for many years and is no stranger to the Ubuntu realm. In fact, the system began as a graphical interface on the Ubuntu server. The company has since been offering the server as a standalone product and in both 32- and 64-bit variants. The current version (3.5) is based on Ubuntu 14.04 LTS, which has support for five years of updates by Canonical. Zentyal is suitable as a server and gateway for small to medium businesses as well as SOHO users, and the software supports explicitly heterogeneous environments. Thanks to Samba 4, the distribution can act as a domain controller within a Windows-based network. The system also comes with a replacement for the Exchange Server. Users can choose between different options on the boot menu of the system. The system itself is largely automatically installed while in normal mode, but Expert Mode allows for better control of the installation. In both cases, users are assisted by somewhat outdated-looking, but functional dialogs through the setup. Because of the limited storage capacity of a CD-ROM, the installer may try to connect to the Internet. When doing so, Zentyal downloads several additional packets and installs them automatically. The ISO image already contains proprietary firmware drivers, which should ensure that even closed WiFi cards manage to establish a connection to the Internet. The base system will be ready for use after just a few minutes, a single soft boot, and an automatic configuration of the core components. After login, Zentyal opens up an Openbox desktop with minimal software configuration and starts Firefox with an authentication screen to begin the server administration. After login, a graphical configuration page appears. In the upper part of the window, you will find four icons with the names Gateway , Infrastructure , Office , and Communications . Each of these categories contain a summary of services. Click below the More Info link to understand which individual modules are contained within. 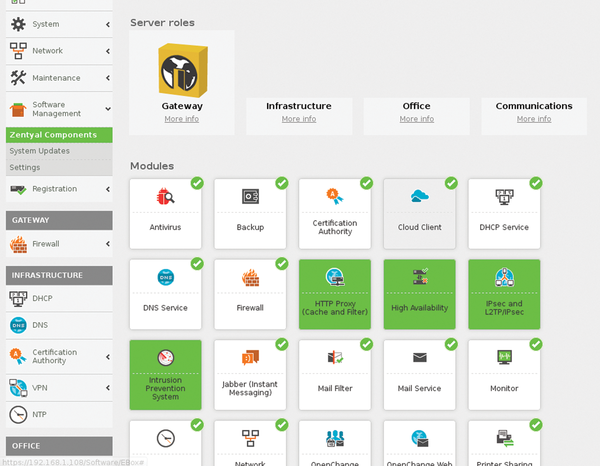 Zentyal lists individual services under the server groups in Modules. One click on the group symbols found in the top pane changes the color of the group associated with each service in the lower segment. The buttons highlighted in green indicate that they are intended for installation (Figure 1). Figure 1: Zentyal arranges the different services as modules into a clear layout. Potential dependencies with other services will be dealt with independently. In addition to the presets of the server groups, users can select on or off for each service with just one click. 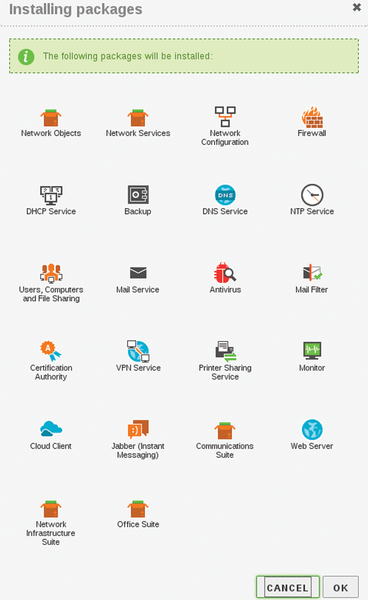 Along with basic modules such as the firewall, DHCP servers, and print and/or file servers, Zentyal offers special services typically only used within large-scale IT infrastructures. These include an intrusion prevention system, a RADIUS server for secure authentication, and a module for management of uninterruptible power supplies (UPS). To increase network security, Zentyal provides various security services such as a filter for web content and an antivirus module. To seamlessly integrate a Windows machine (PC) into an existing infrastructure, for example, the distribution rolls out a Samba server. It establishes a domain for Windows clients and allows for trouble-free data exchange between various system environments. Last but not least, Zentyal comes with a backup module that facilitates easy data backups. After selecting the desired modules, click the lower right corner of the Install button. The system will then switch to a confirmation screen that again lists all of the services that are intended for installation. Here, you will find services that are simultaneously installed as prerequisites (Figure 2). Even with the installation of new services, the distribution assists users with a graphical interface. 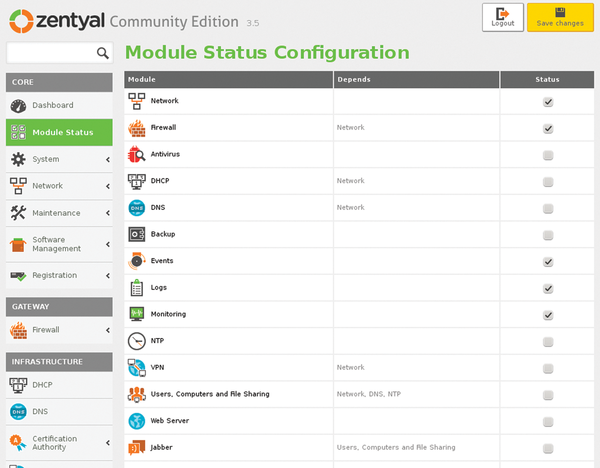 Figure 2: Zentyal tells you which modules will be installed by default. Confirm your selection by clicking OK (bottom right). During the installation of the desired applications, a progress bar will keep you informed of how things are going. After a correct installation, the system automatically configures the new services. During this time, the browser window is disabled so that no navigation in the settings window is possible. After completing the configuration, users will find the newly available services and modules compartmentalized into the different server groups to the left of the browser window in the menu column (Figure 3). Figure 3: Zentyal lists the services that are installed during setup in a bar right next to the main window. If manual configuration is necessary, or if a service consists of multiple processes, the subgroups will show up once you click on the module icon. Under Firewall , for example, the groups packet filtering, port forwarding, and SNAT are available. Because the firewall requires a different configuration depending on the application scenario, users are advised to review the existing filter and provide additional rules if necessary. After clicking on the Packet Filter sub-group, Zentyal displays four possible ways to regulate the traffic in clear diagrams in the right-hand pane of the browser (Figure 4). Figure 4: The built-in firewall does not present beginners with insurmountable hurdles during the configuration. By clicking on Set Rules under each group, you can begin to adjust package rules of each group. The default settings set an a minimum filter system, because they do not contain detailed filters. 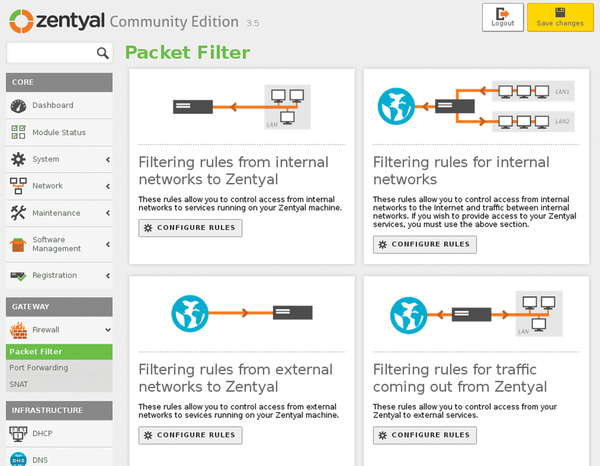 Zentyal inserts the newly defined filter rules into a table that is similar to iptables. However, Zentyal's version is much easier to understand. Basic knowledge of the operation of firewalls and detailed knowledge of iptables will be useful here. To add a new rule, just click Add New Rule under the table view. Click on all of the desired rules in the drop-down menus. In the only free input field labeled Description, you can store a reference to the new filter rules. Finally, users can apply the new rule by clicking Add . Once this is done, the new rule then appears in the table. To manage the status of various services, go to the core group at the top left and click on Module Status . Zentyal will open a list of available modules in the right pane view, each with a checkbox in the last column labeled Status . Users can enable modules by ticking the box next to the desired service. If a service is dependent upon another module, you will be notified that this module will also be set up by the software in a separate message. To apply the changes, click on the yellow Save Changes button in the top right of the window (see Figure 5). Figure 5: You determine which services you wish to activate in the status module with the click of a mouse.